Awwww...let him off his lead, Mum!!! .....so the lead is necessary...! 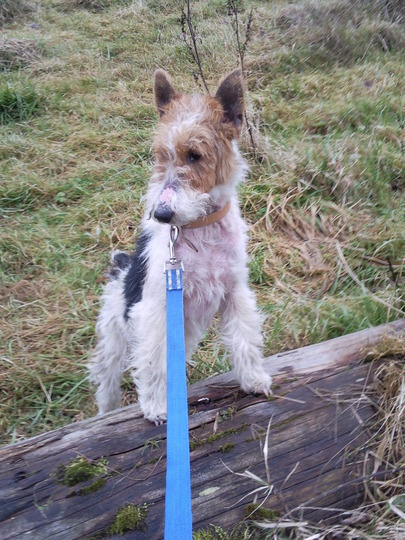 Wire Fox Terriers do well in agility and fly ball games. A Wire will happily join in with any outdoor games where the children are playing, the rougher and dirtier the better. They should be kept on a lead near traffic, under proper control, as they do have a tendency to chase cats or anything else that catches their attention, only because they love to play chasing games. A fully fenced-in garden is recommended. They can live with cats in their own home but outside they will chase them. He looks so much brighter in himself Eileen...bet he was thrilled to see you again ! You sound the perfect new owner to me Eileen seems like he has chosen you! He looks so much better Eileen , really perky ...does he wait for you to come ? . yes I think they are trying to make you feel guilty ..lol... ..
And stay for just a day. And play some games with Tay. Yes , nice poem TT ... I'm sure Cory will be finding a new home before long . looks a sweetie!~hope he finds a home soon! You are doing a wonderful job, Eileen, walking these homeless dogs. No doubt he'll have a good home before you know it... he's a cutie! He does look a happy chappie! I went with my Daughter yesterday to look at a rescue that takes in strays. She wants to help by dog walking. She said it will help her too, by getting her out walking.She can't have pets where she lives and she works full time, so everyone will benefit. Aw Cory I hope he will be happy in his new home, I'm sure you'll miss him Eileen he was so cute. he has such a loveable face i think . Pleased to hear about Cory, hope he is happy in his new home Eileen. My Daughters first walk was an expensive one...an excitable dog jumped up, knocked her over, she fell on a rock and....no harm to herself but broke her mobile phone that was in her back pocket! She kept it with her as the rescue is fairly remote and she wanted to be able to make contact if needed. Oh well, she laughed about it! We donated food, toys and chews too...me being in the trade helps! They are a privately run group and struggling financially so nice to be able to help. These private rescue groups need all the help they can get..
awww your poor daughter PG, glad she saw the funny side tho. What a lovely picture, so expressive.